This is a journal game. Following the alphabet strictly use the next block of 4 pages (i.e. 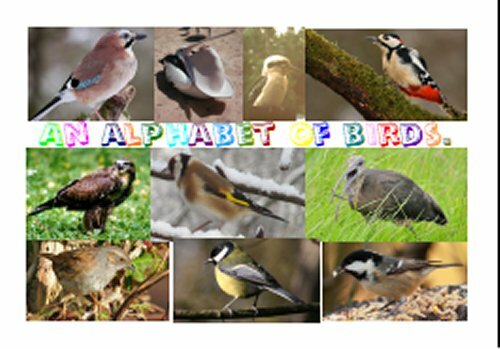 two colours) to write, draw, paint, use pictures, describe – a bird whose name begins with that letter. I have given two examples for each letter in case you are really stuck, but you are welcome to choose your own. For letter Z I could only think of one example. No cheating! I didn’t start with A! Please relist the journal within two weeks. If you can’t complete in that time, please contact me by email. Please be willing to send the journal wherever requested, even if you normally only send to your own country. 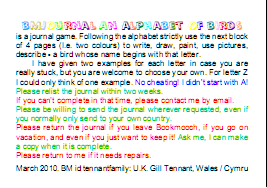 Please return the journal if you leave Bookmooch, if you go on vacation, and even if you just want to keep it! Ask me, I can make a copy when it is complete. Please return to me if it needs repairs.